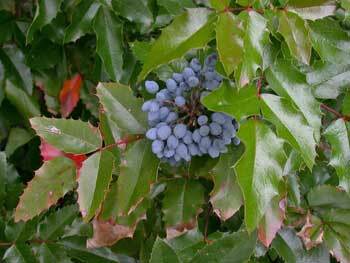 Wild Oregon grape is an evergreen shrub; it has irregular, knotty roots that have brownish bark with yellow wood underneath. The branched stems extend to 3 feet or more and have alternate, pinnate leaves with 5 to 9 leaflets. Ovate or oblong lanceolate, the leathery, sessile leaflets have 10 or more spiny teeth on each side and are glossy dark green on top, pale green underneath. Yellow flowers bloom in fascicled racemes from April to May. The globular blue berries resemble bilberry (Vaccinium myrtillus L.), more commonly called huckleberries. 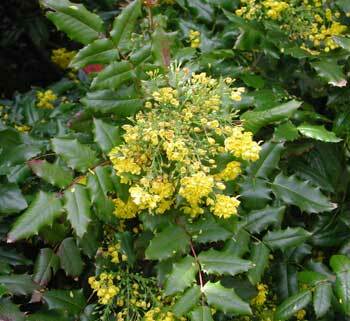 Oregon grape (B. repens), was used by Native Americans. Shoshone name “Sogo tiembuh’; Paiute name “Kaw-danup”; Blackfeet name “Oti to que.” The root was peeled, dried and steeped to check rectal hemorrhage, stomach troubles, and dysentery. Found in mountain areas on wooded slopes below 7000 feet from British Columbia to Idaho and southward to Oregon and California. Native to North America, introduced to Europe as a cultivated plant but has become naturalized there. There are several varieties of this herb, which appear to have similar properties. Thus, 4 are given here, because of this similarity. This is the Pacific Northwest variety of barberry and was used by the mountain folk of California as a preferred treatment for all chronic degenerative diseases, especially cancer and arthritis. Used in the treatment of anemia, not because of the iron in the plant, but rather its ability to release iron stored in the liver. Used in the treatment of liver and kidney troubles, rheumatism, arthritis, hepatitis, jaundice, syphilis, anemia, constipation, leukorrhea, and uterine diseases. Good blood purifier and useful for scrofula and skin diseases such as eczema, acne, herpes, and psoriasis. Women drink it first thing in the morning to stimulate the onset of menstruation. The medical used are almost identical to that of Barberry (Berberis vulgais). Infusion: use 1 tsp. roots to 1 cup boiling water. Steep, strain. Take 1 tbsp. 3 to 6 times a day. Tincture: a dose is from 5 to 10 drops in liquid daily. Large doses have a cathartic effect, causing watery diarrhea and abdominal pains. Avoid in pregnancy; a uterine stimulant.